Product prices and availability are accurate as of 2019-04-18 11:19:50 EDT and are subject to change. Any price and availability information displayed on http://www.amazon.com/ at the time of purchase will apply to the purchase of this product. Don't fret. Whether you're dreaming up a themed birthday, baby shower or afternoon tea party, we've got you covered. Simply, unleash your creativity and let us take care of the rest. Parties are supposed to be fun and effortless with colorful, mind-blowingly delicious delicacies and treats that brighten up everyone's mood, just by looking at them. 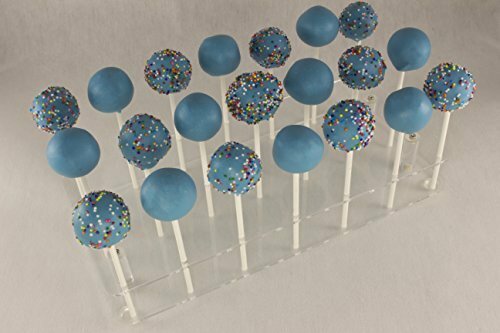 All you need is a few simple decorative accessories, like a smart, premium quality, acrylic cake pop display stand and your party will stand out from the rest. We promise, with this awesome decorating display stand, your delicious cake balls will be the hot talk of the party. Combining convenience and practicality with a superbly elegant design, this premium quality lollipop stand will elevate your party and look great on your buffet. Kids love them, adults love them; Cake Pop holders are a must-have accessory for every successful party. Plus, they are super convenient for moms who like to prepare their own fresh, homemade cake pop or any treat on a stick. Stop compromising the appearance of your cake pops by laying them flat to dry on your kitchen counter or using the same old Styrofoam with hundreds of holes. 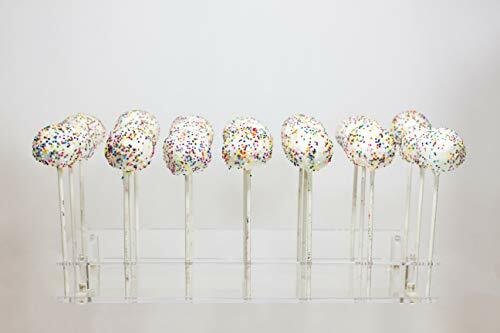 With 21, carefully drilled holes that will keep all standard cake pop sticks safely in place, without wobbling, this smart holder is the perfect way to allow your lovely dessert treats to dry. Compact and easy to wash by hand as well, it will make your party preparations a breeze. Being absolutely sure about the top quality and excellent performance of our cake pop dessert stand, we offer you a 30-day money back guarantee. We are a US Seller and customer service is our #1 priority! THOUGHTFUL DESIGN UNIQUE IN MARKET: ¾ drilled through holes on bottom layer for EXTRA STABILITY, NO WOBBLE, or FALLING-OUT the bottom when lifting the display stand up. 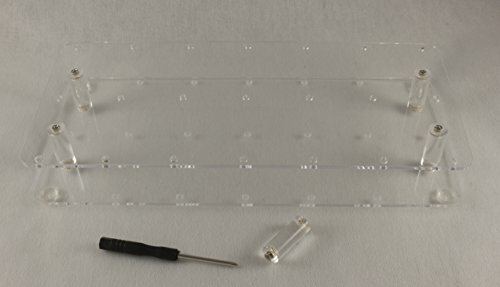 PREMIUM QUALITY & ELEGANCE: 2 Layers of 3 mm DURABLE ACRYLIC with 21 holes. Each hole is 4.5 mm diameter. 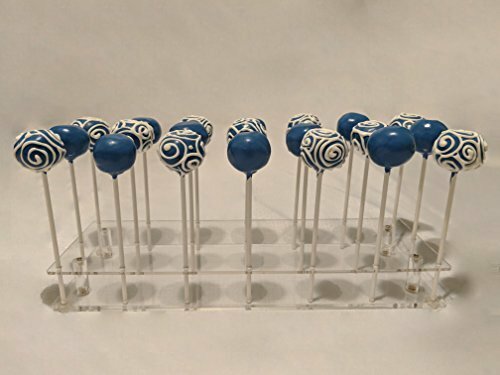 Perfect fit for 5/32"/4 mm or smaller Wilton and all other standard cake pop sticks. These will not work with 5 mm or thicker sticks. SPACE & MONEY SAVING: Compact design 5"x11"x1". Disassemble to lay flat and EASY TO STORE AWAY. REUSABLE & EASY TO CLEAN (Hand wash only). PACKAGING & INCLUDED HARDWARE: Easy to assemble/disassemble. Your Cake Pop decorating stand will arrive in a custom box. INCLUDED in the box is 2 pieces of acrylic, 1 screwdriver, 5 pegs (1 is extra in case one gets lost) 10 screws (2 are extra in case one gets lost). 30 DAY MONEY BACK GUARANTEE: I am a US SELLER and customer service is #1 priority. Love it or your money back. Not satisfied; Get a FULL REFUND. Please contact us if you have any concerns.